By Rachel Held Evans, on May 19, 2014. Heretics are everywhere! Or at least that’s what you would guess from reading the internet these days. To help us sort this out from an historical and theological perspective today, we’re talking to Justin Holcomb. Justin is an Episcopal priest and professor of theology and Christian thought at Gordon-Conwell Theological Seminary and Reformed Theological Seminary. He is the author of the recently-released, Know the Creeds and Councils and Know the Heretics. Justin and his wife Lindsey have also co-written a book on domestic violence called Is it My Fault? RHE: Thanks, Justin, for joining us! Tell us what inspired you to write Know the Heretics. JH: Thank you for taking the time to do the interview with me. I read your blog regularly and I’m thankful to be included in the mix. There are a few inspirations to write this book. My goal was to provide overviews that walk readers through the most important expressions and denials of Christian faith—not with a dry focus on dates and places, but with an emphasis on the living tradition of Christian belief and why it matters for our lives today. These books on Christian history were born out of very important personal experiences. I’ve been interested in heretics since I was 17 (23 years ago) and was encouraged to leave my church by the pastors. It was like a charismatic, non-denominational version of being excommunicated. The church leaders were influenced by the United Pentecostal denomination. United Pentecostals do not believe in the classical understanding of the Trinity. They believe in modalism, which claims that the Father, Son, and Holy Spirit are simply different modes, or forms, of God rather than distinct persons. At 17, I was having intense theological discussions with some of the pastors at this church. Leaders I respected and admired were calling me a heretic, which both hurt a lot and riled me up. By the end of it, we were lobbing the “heresy bomb” left and right. But I was convinced that what I was teaching at the church study group was considered orthodox since basically the beginning of Christianity. I had to study lots of church history, and particularly the history of creeds, councils, confessions, and heresies. Additionally, now I serve an Episcopal priest. In the Anglican tradition, the Apostles’ Creed, Nicene Creed, and Thirty-nine Articles are very important. So, these statement have shaped me in profound ways, some of which I am aware of and probably in many more ways I’m not aware of. RHE: How does the word “heresy” get overused in contemporary Christian culture and why is that a problem? JH: The word “heresy” is overused and misused. The current climate of the church shows that Christians need to relearn the ability to care about right doctrine and have earnest doctrinal disagreements without shouting “heresy!” when we disagree. 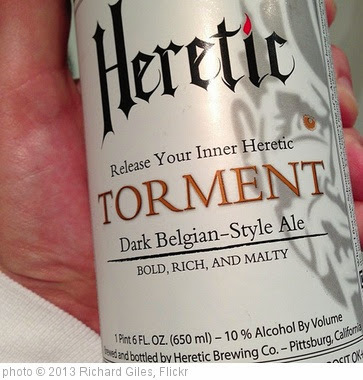 Recently, I’ve also been called a heretic for two reasons. One reason is because in my preaching, teaching, and writing, I emphasize the unconditional grace and love of God because of the work of Jesus Christ. For that, I’ve been called a heretic. 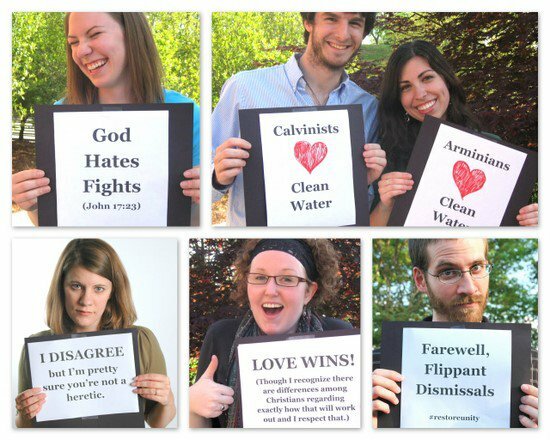 They incorrectly think being an antinomian, (which I’m not), is a heresy. Antinomianism is a wrong understanding of what the bible teaches about the law of God, but it is not heresy. The other reason is because I’m an Episcopal priest. Some have written off the entire worldwide Anglican Communion as heretical. Specifically, because I recruit both men and women for leadership and ministry in the church, some have argued that I “don’t take the bible seriously” and am therefore a heretic. A heretic is someone who has compromised an essential doctrine and lost sight of who God really is, usually by oversimplification. Literally, heresy means “choice”—that is, a choice to deviate from traditional teaching in favor of one’s own insights. Heresy is not located in one’s beliefs about baptism, the continuation of certain spiritual gifts, women in ministry, or political issues. It is a specific and direct denial of any of the central beliefs of the Christian church about the deity and identity of the triune God and about the person and work of Jesus Christ. There are those who think that heresy is anything that does not agree with their own interpretation of Holy Scripture. These people fail to differentiate between the primary and secondary elements of the Christian faith and make every belief they have into a pillar of Christianity. So, on this view, if someone disagrees with them about the millennium, about infant baptism, about the role of women in ministry, they are quickly labeled a heretic. While such impulses can be well intentioned, the church of the New Testament walked the line between holding fast to some convictions and being flexible about others. Though this group of heresy-hunters often say they’re motivated by concern for the faith once for all delivered to the saints, their practice of labeling every diverging belief as heresy has the opposite effect. Rather than making much of right belief, they minimize its importance by making, for example, the mode of baptism as important as the divinity of Christ. When everything is central, nothing is. RHE: Do the words “heretic” or “heresy” appear in Scripture? What is the context? The apostle Peter warns against “false teachers among you [who] will secretly introduce destructive heresies, even denying the sovereign Lord who bought them—bringing swift destruction on themselves” (2 Peter 2:1). These heresies will be contrary to what Christ and the apostles laid down as foundational doctrines. The resulting is spiritual ruin. The New Testament speaks frequently about false teachings and doctrines. For the early church, heresy was merely teaching that stood in contrast to the right belief received from the prophets and the apostles in the Scriptures and put into written formulas in the rule of faith and the creeds. The early church formed an accepted and received statement of what is true and essential to the Christian faith. The rule of faith gave birth to more precise statements of the essentials of the faith, such as the Apostles’ Creed and the Nicene Creed. These widely accepted formulations of the essential “right doctrine” (orthodoxy) handed down from the apostles were crucial for combating heresy. RHE: In your book, you essentially define orthodoxy as adherence to the Nicene Creed. It strikes me, though, that the Nicene Creed was developed in a complex historical context as a way of addressing some very specific questions about Christ’s nature. Why do you consider that creed so important? What gives it its “staying power”? JH: I went with the Nicene Creed because of my ecumenical impulse. For Christianity, the Nicene Creed is a historic, globally accepted creed that encapsulates the Christian faith in a short and rich summary. It covers the basic essentials of 1) who God is, 2) what God is like, and 3) how God saves. I think its “staying power” is connected to that fact that the Council of Nicaea in 325 was a watershed for the Christian church. Shortly after Emperor Constantine legalized Christianity in 313, he convened the first ecumenical, fully representative, universally recognized council of the Christian church. Another reason it is so important is because the council dealt with one of the most important questions that Christianity would ever have to face—what was the status of Jesus in relation to God? Everyone there agreed that Jesus was a divine being, but the Arians could not reconcile the idea that he was the same being as God the Father. After a long and heated debate, the council decided that the evidence from the Bible and tradition lent itself much better to the belief that Jesus was God rather than a lesser being. Later, at the Council of Constantinople in 381, the bishops added a section to include the Holy Spirit as God as well. RHE: You make a distinction between theological error and heresy. Can you explain that? JH: Because there is always some room for mystery and speculation, both the Roman Catholic and Reformed traditions have been careful to distinguish three “zones” between strict orthodoxy and outright heresy. In Catholicism, to bluntly deny an explicitly defined church doctrine is heresy in the first degree. It has to be a severe contradiction, like saying that Christ is not God. A doctrine that has not been explicitly defined by one of the church’s articles of faith but diverges from the received majority view is considered an opinion approaching heresy (sententia haeresi proxima) — for instance, to say that Christ can be found in other religions. One who holds a position that does not directly contradict received tradition but logically denies an explicitly defined truth is said to be erroneous in theology (propositio theologice erronea). Finally, a belief that cannot be definitively shown to be in opposition to an article of faith of the church is said to be suspected or savoring of heresy (sententia de haeresi suspecta, haeresim sapiens). Similarly, the Reformed tradition has traditionally distinguished three kinds of doctrinal error related to fundamental articles of the faith: (1) errors directly against a fundamental article (contra fundamentum); (2) errors around a fundamental or in indirect contradiction to it (circa fundamentum); (3) errors beyond a fundamental article (praeter fundamentum). The point is that, historically, both the Roman Catholic tradition and the Reformed tradition have understood that not all theological errors are equally serious. Theological historian David Christie-Murray distinguishes between orthodoxy, the body of Christian belief which has emerged as a consensus through time as the church reflects on Scripture; heterodoxy, Christian belief which differs from orthodoxy but not to the point of being so erroneous to be heresy; and heresy, belief that deviates and diverges from orthodoxy beyond a certain point on essential teachings. RHE: Do you also make a distinction between orthodoxy and salvation? Might a person hold unorthodox (perhaps even heretical) views and still be saved? And how do those who value the historic Christian creeds as parameters for orthodoxy avoid slipping into a saved-by-correct-theology mentality, which isn’t all that different than a saved-by-good-works mentality? JH: I don't discuss a distinction between orthodoxy and salvation. I do believe that someone can hold heterodox views and still be saved. Also, I believe that if one is made alive by God and saved, that one of the fruits of regeneration is holding truthful beliefs about God and what God reveals. I think a person can hold unorthodox and erroneous views and still be saved. However, I think holding a heretical view, as I defined it as denial of an essential doctrine, is to deny the Savior and his salvation. Salvation is robustly Trinitarian and Christocentric. I agree that we don’t want to slip in a salvation-by-correct-theology mentality. We are saved by God’s grace through faith in Christ. The issue is—In what version of Christ are people putting their faith? Most of the heresies about Christ being either fully God or fully human were not just about abstract metaphysics but were ultimately about salvation. The Christian tradition stated clearly that for Jesus Christ to be the savior means that he must be truly God and truly human. To paraphrase Philip Schaff, the point of the orthodox creeds is not that we are saved by memorizing a set of statements, but that we are saved by trusting in the one who has revealed himself. Trusting in him, as far as he has told us about himself, is what saves, while straying from him is what condemns. Studying the heresies has driven home to me the need for humility. Christians should agree that there exists a perfect orthodoxy in the mind of God; however, the proliferation of schisms, disagreements, and divisions throughout church history points to the fact that we as sinful and fallible humans are imperfect at agreeing precisely on that orthodoxy. The general overview of the heresies and the church’s orthodox responses in Know the Heretics and Know the Creeds and Councils should make it clear how messy the pursuit for theological truth can be. We are not saved by our intellectual precision; we are saved by the grace of Jesus. That does not diminish the importance of correct doctrine, but rather allows it its proper place in glorifying the triune God, who graciously saves sinners because of the person and work of Christ. The line between orthodoxy and heresy has developed over time and through theological conflict, and the line between heterodoxy and heresy is blurry. That means we need lots of wisdom, discernment, and humility before we declare that someone has departed into full-blown heresy. At the same time, we should be clear in our minds on the non-negotiables of Christian doctrine and belief. RHE: While the Nicene Creed references Scripture, its focus is on the person and nature of Jesus Christ, not the nature of Scripture. And yet so many debates among Christians today center around questions about the nature of, interpretation of, and application of Scripture. (And, at least in my world, this is the context in which most accusations of heresy arise.) I suspect you will agree that two Christians can dispute various interpretations of Scripture and, so long as they affirm the creeds, remain within the parameters of orthodoxy. But would you say that two Nicene-affirming Christians could disagree on the nature of Scripture—like, one uses the term “inerrant” while the other finds that unhelpful —and remain within the parameters of orthodoxy? And doesn’t a creedal understanding of orthodoxy, in a sense, place ultimate authority on the tradition of the Church rather than on Scripture? Or does the degree to which Scripture informed the creeds make this a non sequitur? JH: I do think two Nicene-affirming Christians could disagree on the doctrine of scripture and remaining within the parameters of orthodoxy. That was a question I had when I worked on an academic volume of edited essays called Christian Theologies of Scripture. I referred to “theologies of scripture” to include the diverse discussions about the nature, authority, interpretation, and uses (liturgical, political, corporate, personal, etc.) of scripture, as well as the relationship between scripture and tradition. Christians recognize the Bible as authoritative, although the nature and extent of that authority is a matter of debate. Christians agree that the Bible bears witness to the drama of redemption in both the history of Israel and the life, death, and resurrection of Jesus Christ. Within this basic agreement on the importance of scripture, however, various theologies of scripture have emerged. Different theologies of scripture exist not because the Christian tradition is inherently contentious and cannot reach a consensus, but because each moment, era, and epoch raises different questions about the nature, authority, and interpretation of scripture, and about how scripture relates to tradition, reason, and experience. To your question about authority, I do think the degree to which the scriptures informed the creeds is the key. The creeds emerged from scripture and where depending on scripture. If one sees the creeds as extensions of the apostles’ teaching and writing of scripture, there is less conflict between competing authorities. RHE: Okay, Justin, I can affirm the Nicene Creed “without my fingers crossed” and believe the Bible to be the inspired Word of God, but unlike a lot of evangelicals, I support women in ministry and full inclusion of LGBT people in the Church. Am I a heretic? JH: You might be a heretic :-) … but not for holding those views. One approach, which I don't think is helpful, makes every single belief equally important. I don't think it is correct for others to make the views you hold on those issues equal to your Christology. As you know, views on these issues are very important and have serious theological implications. Another approach to avoid is to flatten things out and lower one’s doctrine of God to the level of someone’s view on women’s ordination. My complementarian friends have had some pretty cruel things said about them and have been anathematized as if they are heretics challenging the nature of God. You may be wrong on those issues, but I don’t think holding those positions makes you a heretic. I’m not trying to “let you off on a technicality.” Here’s the deal: We both think we are correct in the views we hold. If I thought I was wrong I’d change my mind and hold a different belief. So, let’s all be honest that we each think we are right. But we also know that there are places where we are wrong; we just aren’t sure where those places are. And we may be wrong either as a matter of fact (maybe God doesn’t want women ordained or infants baptized) or as a matter of emphasis (perhaps we over emphasize the sovereignty of God in salvation). This goes for both progressive and conservative types. If a believer holds to the Nicene Creed, we should not call them a heretic, no matter how strongly we believe they are in error on the details or on other non-essential doctrines. They may still be wrong, and they may be heterodox, but we cannot call them heretics, because they fit within the bounds of historic Christianity. Rather than either of the extremes—nothing is heresy on the one hand, and everything that I disagree with is heresy on the other—the church has continually confessed that heresy is that which deviates from the central teachings of the Christian faith, as expressed in the rule of faith and subsequently in the church’s confessions. As such, Christians today would do well to recover the doctrinal precision of the early church before judging any belief as heretical. An attitude of humble, charitable engagement stands in stark contrast to the spirit of some caustic theological conflict today. Rather than turning disagreement into division, we should contend for the truth with humility and grace. That’s how Jesus treated us.